Every fan of The Sims franchise would know The Goth family. You shouldn’t call yourself one if you don’t know them since they’ve appeared in every game so far. While they’ve been in every game, they’ve always appeared in different ages and sometimes we have someone missing or a new addition. There are also other related Goth and Bachelor (Bella’s family) extended families in the game, but I am going to focus on the main iconic family for this post. I’m excited that we are going to see The Goths again soon in The Sims 4. Let’s take a look at how the family has grown throughout the years. 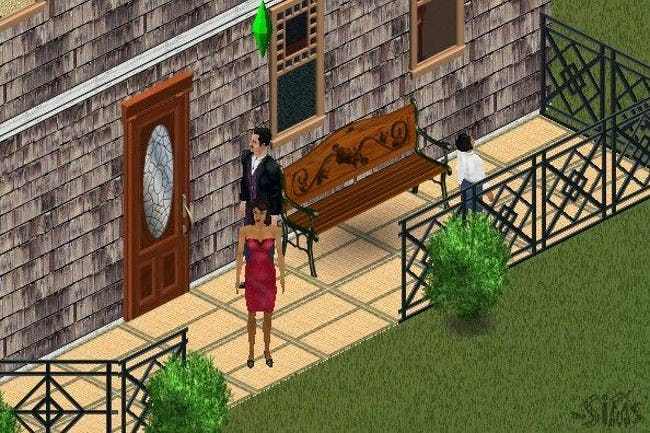 We were introduced to the Goth family in the first The Sims game. The family was comprised of husband and wife Mortimer and Bella in addition to their young daughter Cassandra. They were actually my ‘practice’ family when I was still trying to get the hang of playing the game, and I love playing them until now. I assume the couple were adults in this game. The first game still didn’t have life stages since Sims didn’t age in the first game if I remember correctly. It’s important to remember their age because it varies as the series progresses. The second game brought back the Goth family, but the difference is that more than 20 years have passed. Mortimer is an elder who is dating a gold digger Caliente sister. Bella is somehow missing (she’s actually in another town), but before that she managed to have one more son with her husband named Alexander. Cassandra is romantically involved with the town’s Casanova. This is the first game to truly incorporate back stories in the game so it was fun playing the game based on those stories. I also started to notice that Mortimer is slightly older than Bella since he is an elder and the latter is only an adult in the game. This time we go back into the past when Bella and Mortimer are only kids and live in separate households. Before Bella was a Goth, she was a part of the Bachelor family with her parents and brother. Mortimer lives with his parents as an only child in a huge mansion. If you leave story progression on, the couple could end up together once they grow older. This happens to me almost all the time provided I don’t pair them up with anyone else. However, there is a rare chance they do decide to travel a different path. It seems like we are going to be seeing the Goths close to their original form. Based on what we know so far, it’ll only be Bella and Mortimer. I’m assuming that Bella will be a young adult and the producers already said that Mortimer is older when they added wrinkles to his face during the promo video so he’ll be an adult. This is perhaps set before the first game when they first got married. That could explain the absence of Cassandra in the game. I’m excited to finally see the couple “together” after two games.